There are a variety of pickles in Japan. They are usually served with rice as side dish or with drinks as a snack. Many Japanese dishes are served with some kind of pickles, for example, sushi with sweet pickled ginger, beef bowl with red pickled ginger, and curry with fukujinduke (vegetables pickled in soy sauce and sugar based sauce). Some Japanese pickles need time and special ingredients but some can be quickly prepared with a few ingredients. 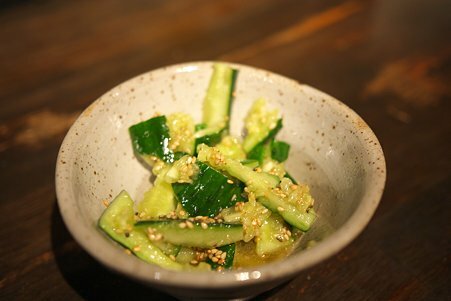 Today, I want to share an easy recipe of Japanese pickle. 1. Rub cucumbers with salt or put salt on a cutting board and roll cucumbers on it. Wash salt off with water. 2. Beat the cucumbers lightly with pestle stick or meat tenderizer hammer. Cut the cucumbers. 3. In a pot, put the all pickle sauce ingredients and boil it. 4. Turn off the fire and throw the cucumbers while the sauce is hot and mix well. 5. Sprinkle some sesame seeds and ready to searve. 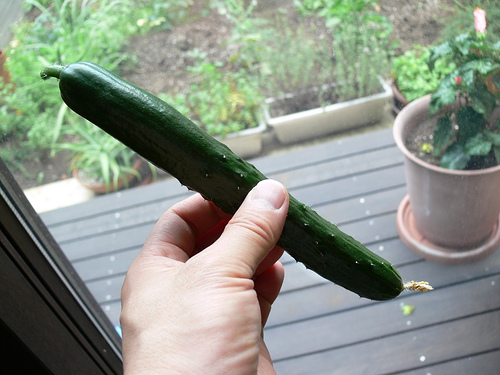 The picture is a Japanese cucumber. If you use thicker cucumber, you might want to use one and half cucumber instead of three.